A reversible garment, it’s a hoodie on one side and a hoodie with a built-in extra-insulated vest on the other. Wear the hoodie-only side and you’ll look like you’re rocking a regular hoodie, leaving everyone wondering how the hell you’re not shaking with the flimsy outfit you decided to put together on a particularly chilly day. Put the reverse side on and it resembles the iconic Windrunner track jacket that became the face of Nike apparel back in 1978, adding a stylish touch of retro to your garb. Described as “the ultimate in innovative warmth,” the Nike Tech Fleece Aeroloft Windrunner is actually a two-part garment, combining a hoodie cut in Nike Tech Fleece (smooth jersey fabric with a nylon spacer that traps body heat) with a Nike Aeroloft vest that’s packed with premium 800-fill down to deliver warmth without being dragged down by heft. Features include tiered perforations that allow excess body vapor to escape, elastic trims to help trap warmth, and pockets with bonded zippers to keep small items secure. 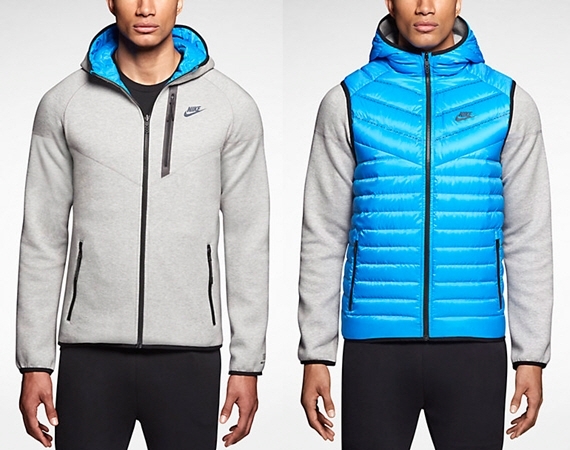 Available in both men’s and women’s styles, the Nike Tech Fleece Aeroloft Windrunner retails for $350.